Get It Done Now – It’s Good For Your Health! 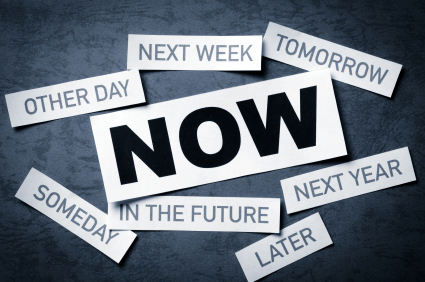 Are you a “get it done now or get it done later” person? Did you know that it takes more energy to not do something than to just do it, especially if you are going to do it anyway. We rarely, if ever, think about the amount of energy we use to ward off not doing something we need to do. Some people may call this procrastination or laziness. It doesn’t matter what you label it. Putting off doing what you need to do can negatively affect your health and well-being. When we put off doing what needs to get done, by avoiding it and doing other, non-important things, internally we may be building increased levels of stress, worry, anger, resentment, and fear that we won’t get it done or feelings of inadequacy. What would it be like if you just did the task or made that decision? What if you jumped in and got started on that project and avoided all of the associated stress? Or, what if you stopped all of the ways you keep “busy” doing other things and not feeling, while avoiding what you really need to do? Try it today. Do something you’ve been putting off NOW!